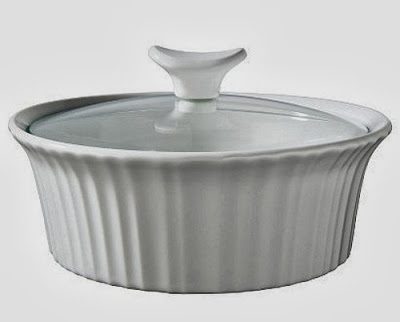 CorningWare 411: Freaky French White Fenomenon Finally Figured Out - French White II? Freaky French White Fenomenon Finally Figured Out - French White II? A while ago I posted about the weirdly shaped pieces of "French White" I was finding around town, all of the sudden. They tend to be squared off, such as the 13x9 baking dish or the 7x5 Loaf pan. All of them sort of have "flared" handles on the ends. Well, a round dish doesn't really have "ends", as it were, however the 4 quart roaster that I recently found at PACS (Portland Adventist Community Services) does have "ends", kind a, sort a. So, as fate would have it, I was thumbing through one of my older cookbooks looking for something or other when a piece of paper caught my eye. I had made a notation about buying an "8x8 FWII baking dish". That particular cookbook was a Christmas gift from 1996, so it was sometime after that. Translating my own chicken scratch, I am pretty sure that I needed and 8 inch "square" French White dish. Granted, I never did purchase the baking dish, but it jogged my memory and removed a few cobwebs. The Loaf pan (CW-315) fosters the baking sandwich bread instead of boule in a Souffle dish. The cover for the loaf pan is designed the same way as the cover for the 13x9 casserole (above). It is marked as CW-315-VPC. The 8x8 inch square baking dish (which is what I had made the notation about in the cookbook) allows for straight lines when cutting brownies and bar cookies. Mind you, at the time ('97 or '98) I didn't have a P-322 in Cornflower like I do now. In fact, I think I only had a couple of Vintage Saucepans (P-1 3/4-B and P-2 1/2-B) and a Loaf Pan (P-315) for baking bread. Everything else I owned was of the Everyday Gourmet French White persuasion, like the 16 oz Ramekins (F-15), the 1.6L Souffle (F-5-B), the 10 & 8 inch Quiche (F-3 & F-8) and a 2.5qt Roaster (F-4-B). The base design is/was the same, so old and new versions coordinate together fairly well. I believe, from my notation, that is was called "French White II". I may be wrong (It's been known to happen on many occasions), but that is what has been in the back of my mind since I found the cryptic note in that cookbook. So, I did some poking around the internet, and while I cannot find any specific reference to a French White II, I DID find a reference to French White III. It's currently being made by World Kitchen, thus it is made of stoneware, as are all pieces of French White since 1999, but I find the use of the III to be intriguing. If they are on "version 3" of the French White design, then it bodes well for my theory that this other stuff is "version 2". OK, so now that I have solved this little mystery, I would like to move on to the recipe that I supposedly needed the French White II baking dish for... Blondies Muah ha ha ha! It appears that I had tried the recipe from the cookbook and then called my Mom to get Grandma's recipe. (Thus the REALLY bad penmanship and shortened words like "B Sugar") I just bet that Mom told me that Grandma baked them in an 8x8 Corningware baking dish (P-322). I am also fairly sure that by 1997 the original P-322 had been discontinued, in fact, it was more than likely discontinued a lot earlier, since it seems to only be available in Cornflower, Floral Bouquet, Country Festival, Spice O' Life, Wild Flower and Just White; all of which are older patterns. I am thinking that the 8x8 in French White II was probably the closest I was going to get at the time. 1 1/2 quart Saucepan (P-1 1/2-B) I'm using my 2 1/2 quart Rangetopper (N-2 1/2-B), cause I haven't cooked in it yet, but a 1 1/2 quart is plenty big enough. Melt the Butter in the 1 3/4 qt saucepan set over medium flame. Continue cooking until little bubbles form around the edge of the saucepan. Meanwhile, in a small bowl, or pitcher, whisk Eggs and Vanilla together. In a small bowl, combine the Flour, Baking Powder, Salt and Pecans and set aside. When the sugar mixture begins to bubble, remove the saucepan from the flame and slowly pour the Egg mixture into the Sugar/Butter mixture, whisking constantly to prevent egg scramble-age. Add the Flour/Nut mixture to the Egg/Sugar/Butter mixture and fold them together. Remove from the oven and allow to cool for at least 15 minutes before removing from the pan. Now kick back with a large cup of coffee and enjoy the salted butterscotchy goodness. I recently found a 2 qt. French White II in a thrift store with an accompanying lid but it doesn't fit particularly well. May I ask what the number is on the lid you found for yours? If it matches yours, then I know I'm just being finicky. Also, is there any chance a French White II section will be added to the "Known French White Pieces" section of your blog?